New to the Royal Kerckhaert Horseshoe Company, concave shoe program, is the Steel Kings Extra Sound Plus (ESP). Designed especially for ex-racehorses as they start their new career as a riding horse. Designed along the same lines as the bestselling Steel Extra Sound training shoe, the Extra Sound Plus has the same easy to fit shape as the original Steel Extra Sound training plate. 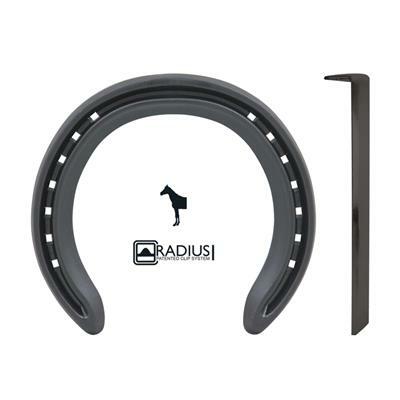 It also combines all the great features found in the steel ES, Radius clips, sole relief, boxed off heels, perfectly punched nail holes with the correct pitch and coarseness to match the feet of ex-racehorses. The hind shoes are left and right pattern, with the same easy to fit shape. The wider outside heel with the narrower inside branch allows you to fit the shoes quickly and safely. The high-quality steel and the extra thickness of the material makes this the first riding shoe produced especially for the ex-racehorse. Once again the Royal Kerckhaert Horseshoe Factory wins the race to produce the perfect horse for the ex-racehorses.